The Tappex Setsert® is designed for cold press installation into hard and filled thermoplastic and thermoset plastic materials. Available as a Single and Double Ended brass insert. This brass threaded insert includes a helical knurl with a broaching form and undercuts to enhance rotational and pull out performance. Often the physical properties of glass filled thermoplastics and thermoset plastics can give rise to high installation forces using conventional press fit thread inserts. In the worst case this can set up significant bursting forces in thin wall bosses and result in lower than expected pull out and rotational performance. 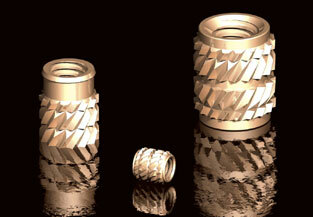 The Setsert design utilises a combination of a broaching feature and helical knurl to cut into the material reducing the build up of stresses. In application the torque applied through the fastener is transmitted by the helical knurl form into the plastic, the helix tends to work against the forces ultimately trying to remove the insert. The double ended Setsert threaded insert simplifies orientation before installation into the plastic moulding for manual and automatic assembly methods. Reduced installation force over conventional press fit inserts. The part number is defined 076 and 476, followed by the thread size. Available in sizes from M3 to M5, other sizes available to customer order.